Light has always been extremely crucial part of every home and workspace, and choosing good and efficient bulbs can save you a lot of trouble and problems related with providing your living- and working-space with consistent high-quality lighting. Once it comes to providing the house with a proper lighting, one should pay attention not only to the lights inside the house but also think about the outdoor lights. For these purposes most of the people go for outdoor flood lights that indeed seem to be the best and most effective solution to choose. 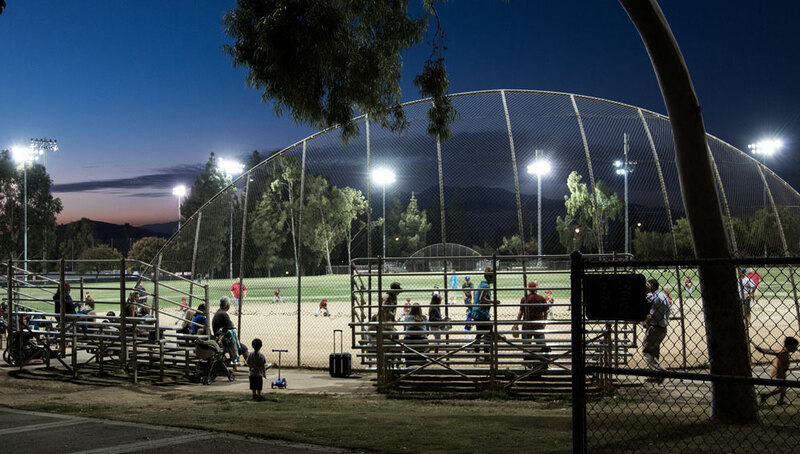 The following article focuses on explaining outdoor flood lights, their primary functions and specifics as well as gives insight into different bulbs that can be used in flood lights. The technology of a flood light is actually not that complicated and all the definitions provide simple and brief explanation: flood light is an artificial light so directed or diffused as to give a comparatively uniform illumination over a rather large given area. In other words, flood lights are artificial lights with broad beams and high intensity providing greater amount of light than the lamps used for regular indoor lighting objects. These lights are used not only to illuminate private houses and their yards and increase the safety but also to illuminate big outdoor sports events, plays, concerts and other events. There are both indoor and outdoor flood lights but as the aim of the article is to inform the readers about the specifics of outdoor flood lights the information provided below will be related to the former ones. If you are not too familiar with the market for flood light you might at first feel quite overwhelmed by all the options you will find and all the considerations you will have to make in order to find the product which would be the most suitable to you. In fact, modern flood lights come in different sizes and can include different features such as dusk to dawn sensors and motion sensors. Therefore you should carefully think through what purposes your flood lights have to serve. Location: What is the target-object you want to illuminate? The lights have to be located in such position so that they do not blind anyone standing outside the area. Moreover, mount the lamp so that it does not disturb your neighbors. This can be achieved by placing your lamps downward at an angle that would be approximately 22 degrees. Also keep in mind that some of the flood lights can heat up quite significantly and hence they should be placed at least 9 feet from the ground in order not to harm anyone. Dusk to dawn lights: Do you want the flood lights to primarily function as extra safety tool to protect your house from unwanted visitors? Then dusk to dawn feature is something you should really think about as it is possible to buy flood lights that automatically turn on when the sun sets and turns off in the morning when the sun rises. Motion sensors: Do you want your flood lights to be working long hours or you want them to turn on when someone is actually approaching the house? The latter option seems the most reasonable one and therefore one of the best choices available is to purchase solar motion detector lights. Types of bulbs: This perhaps is the most important of aspects that you will have to carefully decide upon. The options of bulbs that can be used in flood lights are numerous and since it is the main consideration you will have to face when making the purchase, all the most common bulbs that can be used in flood lights are listed and described in the next section. Halogen Flood Lights. 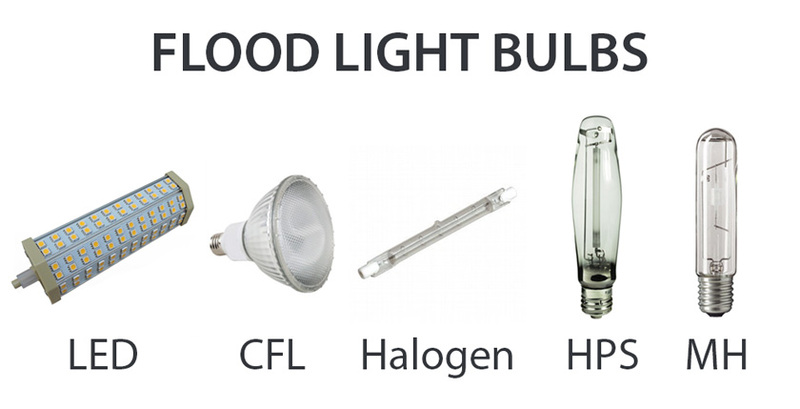 Due to their high-quality performance halogen bulbs have become one of the top choices once it comes to flood lights. Halogen bulbs are bright and suitable for pretty much any outdoor purpose. Halogen gas and tungsten filament within bulb is being activated by electricity creating steady, strong and very intense beam of white light. Moreover, the intensity of halogen flood lights is notably higher than for other types of bulbs with the same wattage. However, halogen bulbs are very inefficient and have short life span, making other type of flood lights such as LED flood lights a better option for areas, where light needs to illuminate for long hours. Fluorescent Flood Lights. The main advantages of fluorescent flood lights are the fact that they are energy efficient and their lifespan is comparatively long. Fluorescent lamps are quite expensive but they are still cheaper than LED and HID bulbs and that pretty much is the main advantage. The disadvantages however are quite notable and the main downside of using CFL in your flood light lies in a fact that fluorescent bulbs contain mercury which if not disposed and recycled properly can do harm both to your health and environment. Plus fluorescent bulbs have quite long warm-up period and their lifespan is very dependent on their usage and maintenance. If you will regularly turn the lamp on and off (which for instance is the case for motion sensor flood lights), the lifespan of the bulb will notably decrease. Light Emitting Diode (LED) Flood Lights. If analyzed in such aspects as energy-efficiency, lifespan, physical qualities and features, LED happens to be the best of all the options for outdoor flood lights. First of all, LEDs consume around the same amount or less energy than fluorescent bulbs and they can last very long (up to 50, 000 hours) if properly used and maintained. This will have a very positive impact on your monthly electricity bill. Another great advantage is that it takes very little time for LED bulbs to reach maximum brightness. Moreover, compared to all the options listed above they are very environment-friendly and cannot cause any significant damage neither to environment nor your health. Although it does seem like the best of all the options, it has to be pointed out that LED bulbs are also the most expensive ones. However, if you need the best type of bulb and are ready to invest in your outdoor flood lights, LED bulbs surely is an option to go for. It depends on the power of the solar light, the area you need to illuminate and how well you want to illuminate that area. I would say that if you need the light for home usage, say to simply illuminate an area in your yard or around the house so you can see where to walk in the dark, then most high power led solar flood lights will be up to the task. However, if you need the light for something more specific such as illuminating a sports field or for any other situation where proper light coverage is crucial, than I would recommend getting a wired led flood light. What brand of LED bulb will work in a motion light. I find the LED bulbs do not work well in the motion light fixtures. I have called the manufacture of the fixture and they don’t recommend the LED for motion lights. I need a new motion fixture and hate to buy one that in a few years you won’t be able to purchase a bulb for. Generally, most LED motion lights don’t have changeable bulbs and most manufacturers don’t sell replacement parts for their fixtures. However, LED bulbs have very long lifespans, especially motion lights that don’t illuminate for prolonged periods of time. Usually the lifespan of LED bulbs can go from 20000 even up to 50000 hours, so you practically won’t have to worry about replacing them for many, many years. All in all, LEDs are hands down the best type of bulbs you can have in a motion flood light – they are durable, long lasting, energy efficient and turning them on and off frequently (which is what motion detector does) doesn’t negatively impact their lifespan. Arthur, Thank you for responding. I have purchased one of the older style motion style fixtures, with the adjustable spotlight type. The stores are not selling incandescent bulbs and I have called numerous LED bulb manufacturers and they say that they do not recommend their LED bulbs for a motion light. The fixture seems useless at this point. I have also purchased one of the complete LED motion light fixtures, it is in the $50.00 range. After getting home I read the reviews and there are many complaints with sputtering and not turning off. I called this manufacturer and the representative agreed that this one had problems and since I have to pay someone to install it, he suggested I return it. Do you know a complete fixture that can be relied on to work properly? I have read the reviews on the ones in the $100.00 range and they have a lot of complaints too. I really need to have a motion light, but don’t see an option. I have tried to get assistance at both Lowe’s and Home Depot. Neither store had anyone that knew anything about LED’s in motion lights. They both said anything can be used in any fixture. I found a statement on one LED bulb that actually said that it could not be used in a motion light. I actually bought some bulbs that are motion activated. They work for my daughter, but because I have a wide overhang and beveled glass on my wall fixture, they won’t work for me. That is what the manufacturer of the bulb told me. This was not for a flood light, but for wall beside the door application. What can I do. If you know of one of the complete fixtures that really works reliably I would like to know. I can’t afford to pay someone to install the fixture over and over. My motion sensor light comes on during the day when i walk by it, why does it do this. Maybe sensitivity of the motion sensor has been turned up. Look for an adjustment knob somewhere on the sensor and try to decrease the sensitivity. Brenda, get par38 halogen bulbs for the older fixture. I am having issues with replacing halogen floodlights with LED in an older light (non motion or light activated). My fixtures are WF Harris. The LED bulbs will not work. I have noticed that halogen lights have a ground wire, or soldered wire, to provide ground. The LED lights do not. I have looked for a ground with a multimeter and have not found one. What gives? If the driver of the LED light is double insulated then it doesn’t need a ground wire, since the grounded wire would provide no additional benefits that the double insulation doesn’t already give the light. Next story How to Correctly Dispose Fluorescent Light Bulbs and Tubes?